Internet only auction of the contents of the former Rooster Fish Brewing Company. Auction will include restaurant fixtures, refrigerators and other collectibles. Please note that pick up and payment location is in Watkins Glen, NY. Starts: Monday December 3rd at 6:00 p.m.
Live Preview: Wednesday December 5th, 9:00 a.m. – 11:00 a.m.
Winning bidders will be notified by email. Online liquidation of restaurant equipment, including fixtures, refrigerators and collectibles. Payment and Pick up: Thursday Dec. 13th and Friday Dec. 14th 10:00 a.m. – 2:00 p.m. *Please note that these are the only payment and pick up days, so please plan accordingly…our staff will not be available at that location after those designated days. These are the only pick up and payment times/locations. Payment and Merchandise Pick up that does not occur prior to 2 p.m. on Friday Dec. 14th is subject to additional fees. Delivery is possible on selected items, for a fee. To make arrangements, bidders must call our office at 585-343-4529, prior to the end of the auction. Delivery would take place Dec. 15th or later. 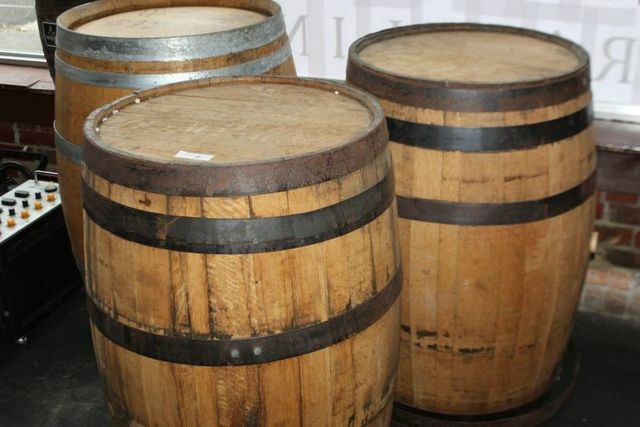 2 3 (3) LARGE OAK BARRELS ( FOR DISPLAY ONLY) (2) BARRELS MEASURE 35″x37″x22″. 10 1 VINTAGE WINE / FRUIT PRESS (UNKNOWN MAKER) IN GOOD CONDITION, 54 INCHES TALL AND 30 INCHES ACROSS, W/ PRESS HANDLE. 12 1 GROUPING OF APPLE, DELL COMPUTER ITEMS. MONITORS, EMAC, MACINTOSH 9600 / 300, KEYBOARDS AND MISC. 16 1 ROUND CLOTHING DISPLAY RACK (44 INCHES DIAMETER) 68 INCHES TALL. 18 1 GROUPING OF EXTRA EDISON LIGHT BULBS AND THE LIGHT STRINGS IN THE TASTING ROOM. 19 1 (2) PRECISION WARMERS (ELECTRIC), R1-100 MODEL, SOLD TOGETHER, 1 W/ DAMAGED HANDLE. 21 1 ROTATING 16 CUBE DISPLAY RACK (USED FOR CLOTHING), 53 INCHES TALL. 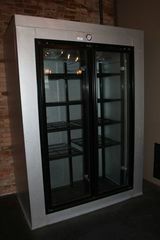 22 1 WITT 2 DOOR REACH-IN COOLER, (MODEL ASLA25-48-A), TWO GLASS DOOR FRONT. UNIT IN GOOD WORKING ORDER. (REMOVAL OF ALL REFRIGERATORS MUST BE DONE PROPERLY. IF ANY DAMAGE OCCURS TO THE BUILDING OR FIXTURES, IT MUST BE REPAIRED BY THE BUYER.) THE COMPRESSOR IS LOCATED 50 FT AWAY – INSIDE BUILDING. 24 1 PRIVACY PARTITION LOCATED IN THE MENS BATHROOM; TOTAL SIZE: 60″ X 61″. 25 2 (2) AMERICAN STANDARD URINALS; 1 GALLON FLUSH W/ AUTO FLUSH; SOLD WITH THE DIVIDER. 27 1 NATIONAL 20 FT. SHUFFLEBOARD TABLE W/ PUCKS AND WAX, IN GOOD CONDITION. 28 1 AMERICAN SHUFFLEBOARD SCORE BOARD, (W/ SOME MARKER DAMAGE). 30 1 DOUBLE COPPER TROUGH W/ 2 DOUBLE FAUCET SET, LOCATED IN THE LADIES ROOM. TOTAL SIZE: 55 INCHES WIDE, 18 INCHES DEEP. (NATIVE TRAILS MODEL CPS208). 31 1 WILLIAMS “SATIN DOLL” PINBALL MACHINE, IN WORKING ORDER. 32 1 SMART BALL SKILL ALLEY SKEETBALL MACHINE, WORKING (ROUGH, SOLD W/ EXTRA MACHINE ON SECOND FLOOR FOR PARTS). 33 1 GROUPING OF 3 CHALK BOARDS (4’X3′), LARGE WHITE BOARD 6′ X 31/2′, AND FRAMED POSTER. 34 1 FUN POP POPCORN MACHINE, MODEL 2408, MADE BY GOLD MEDAL COMPANY, 110V/ 1053 WATT, WORKING MACHINE, SOLD W/ EXTRA POPCORN AND OIL. 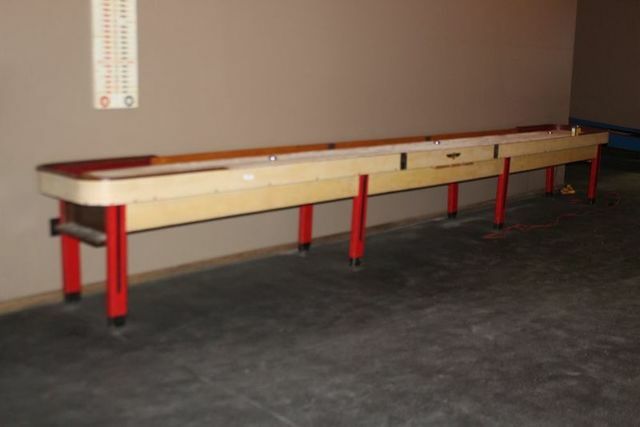 36 1 FREE STANDING BAR, MEASURING: 167 1/2 ” X 17″ X 42″ TALL, 3 INCHES THICK, MOUNTED ON THE FLOOR AND ON THE CEILING. 38 1 FANIMATION BREWMASTER BELT-DRIVEN CEILING FANS, 1 MOTOR (110 VOLT), 4 CEILING MOUNTED FANS, MODEL: LONG NECK FP 20. 39 1 FANIMATION PUNKAH CEILING FAN, GROUPING OF FOUR, MODEL: FP 780 / FP 720, 110 VOLT. 40 1 3-BAY STAINLESS STEEL SINK, 6′ X 20 1/2 “, BAR BACK. 41 1 L-SHAPE WORK STATION: 40″ X 40″ X 20″ DEEP, BY 30″ TALL. 43 1 2 PAPER TOWEL DISPENSERS, 2 HAND SOAP DISPENSERS W/ HAND SOAP. 44 1 ALL ROUGH CUT LUMBER LOCATED IN THE TAP ROOM WALL- BUYER IS TO REMOVE THE LUMBER. 45 1 MODEL 41 CHESTER ENGINE HOIST W/ TROLLEY, I-BEAM IS NOT INCLUDED. 48 1 ADVANCE TABCO STAINLESS STEEL SINK, 75″X20″X36″ TALL, 3- AY SINK W/ (2) SIDE TABLES. 49 1 HAND WASHING STATION, 12’X16′, W/ PAPER TOWEL DISPENSER AND SOAP DISPENSER. 50 1 GROUPING W/ MOP BUCKET, BROOM, VACUUM, MISC CLEANERS. 51 1 WARING PANINI SUPREMO COMMERCIAL PANINI MAKER. 52 1 ADVANCE TABCO STAINLESS STEEL SLOP SINK, 2 FT. X 2 FT. W/ SOAP AND TOWEL DISPENSER. 59 1 GROUPING OF ASH LUMBER MEASURING: 3″ X 9-10′ X 98″. THIS ASH WAS USED TO MAKE THE BAR TOP IN THE TAP ROOM. 34 TOTAL PIECES. 66 1 WOODEN WORK BENCH W/4 DRAWERS, MEASURES: 50′ X 21′ X 32′. 67 1 GROUPING OF WOODEN WINE RACKS. 68 2 (2) WOODEN DISPLAY RACKS. 69 1 WOODEN TABLE DISPLAY W/ (10) METAL BASKETS. 70 1 GROUPING OF (3) WOODEN WINE RACKS (6FT TALL). 71 1 ROOSTER FISH BREWING RACE CAR, PLASTIC SHELL, MEASURES: 8′ X 32″. 72 1 EMERSON CHROMALOX ELECTRIC HEATER, MVH -25-2, 240 VOLT , 3 PH. 73 1 METAL CABINET W/ SUPPLIES, 6 1/2 FT TALL, 2 DOOR. 74 1 GROUPING W/ FURNANCE, HOT WATER TANK, STOVE, REFRIGERATOR, AND MISC. EQUIPMENT ( SCRAP LOT). 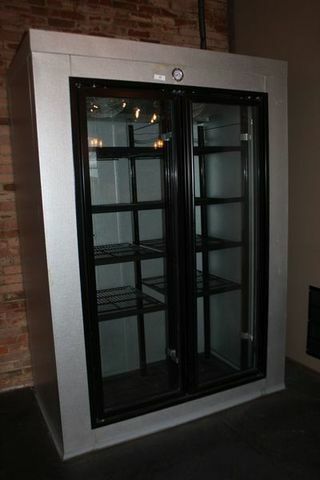 75 1 PERLICK FREEZER, MODEL ST 48, 110 VOLT, USED IN THE ICE CREAM SHOP, TESTED – IN WORKING CONDITION. 76 1 PALLET LOT OF RESTAURANT SUPPLIES, GREENWARE, TICKETS, NAPKINS. 78 1 ROUGH GOODYEAR TIRE SIGN 66′ X 24′. 79 1 ADVANCE FRENCH FRIED POPCORN MACHINE, (WORKING), DOES HAVE CRACKED GLASS, ON THE DOOR. 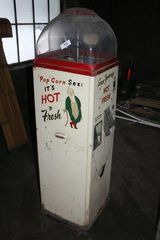 80 1 MANLEY POPCORN MACHINE, NOT TESTED, 220 VOLT, MODEL STYLE 47, W/ BASE AND CASH DRAWER. 81 1 DISPLAY CASE: 40″ X 12″ X 38″, PLASTIC. 83 1 VINTAGE WOODEN WORK BENCH MEASURING: 92 1/2″ X 25″ X 32″ TALL. 84 1 VINTAGE WOODEN WORK BENCH MEASURING: 91″ X 24″ X 32″ TALL. 85 1 LARGE CORNER CUPBOARD W/ WAINSCOTING, AND GREAT PAINT: MEASURES 117″ TALL, 42″ ACROSS THE FRONT, 37 ” DEEP. 86 1 METAL CABINET W/ CONTENTS 6 1/2 FT TALL. 87 1 CONTENTS OF TOOL ROOM. 88 4 4 ROLLS OF COMMERCIAL RUBBER FLOORING, 1/4″ THICK AND 60″ WIDE (AS USED IN THE TAP ROOM), THESE ARE VERY HEAVY, BUYER MUST BRING OWN EQUIPMENT TO REMOVE THEM. 89 1 (3) PAPER TOWEL DISPENSERS, (7) TOILET PAPER DISPENSORS, ALL SOLD AS ONE LOT. 90 1 HUSQVARNA HV700H LAWN MOWER W/ RAKE. 91 1 GROUPING OF LIGHTING, TOOLS, STRAPS, SIGNS, AND PLASTIC FOLDING TABLES. 92 1 WOODEN FRONT COUNTER MEASURING: 50 1/2″ LONG, 29 1/2 WIDE, 36 1/2″ TALL. 93 1 PLASTIC TABLE, WARMING BOX, IGLOO COOLER, 3 GAS CANS, PAIL, AND HARP NEON SIGN. 94 1 LARGE COMPRESSOR CONDENSER FOR A LARGE WALK-IN COOLER, 3PH, 240 VOLT, UNIT WAS WORKING WHEN REMOVED. 96 1 ITEM HAS BEEN REMOVED FROM THE AUCTION. 97 1 2 WICKER TABLES, MEASURING: 28″X18″X17, AND 17″X17’X21″. 98 1 ITEM HAS BEEN REMOVED FROM AUCTION. 99 1 ELECTRIC STOVE HEATER – WORKING CONDITION. 100 1 3 PC. LIVING ROOM SET W/ (2) END TABLES AND LARGE COFFE TABLE. 101 1 STUDENT VIOLIN W/ SOFT CASE. 102 1 (2) END TABLES W/ SIDE CHAIRS. 103 1 FREE STANDING WOODEN PORCH SWING. 104 1 METAL BISTRO TABLE W/ 2 CHAIRS. 105 1 TKO METAL FRAMED STAND W/ HEAVY BAG & SPEED BAG. 106 1 GROUPING OF 7 VARIOUS PRINTS AND POSTERS. 107 1 BUICK SIGN AND A BOX OF SANDPAPER. 108 1 ITEM HAS BEEN REMOVED FROM AUCTION. 109 1 ITEM HAS BEEN REMOVED FROM THE AUCTION. 110 1 SNOWSHOES, FROG, AND MOTORCYCLE FUEL TANK. 111 1 DROP LEAF TABLE W/ DRAWER MEASURING: 36′ X 45′, AND TWO LAMPS. 112 1 UNIQUE OAK VICTROLA CASE, (NO PLAYER, JUST THE CASE) W/ VENEER DAMAGE. 113 1 BAKER’S CABINET W/ 3 DRAWERS, MEASURING: 46′ X 25′ X 30′, DOOR AND HALF MOON BIN. 114 1 EMOTION BLISS 130 KAYAK, NO SKIRT OR PADDLES. 115 1 DR. PEPPER LIGHT UP SIGN AND PEPSI SIGN, SOLD TOGETHER FOR 1 PRICE. 116 1 TASK FORCE TOOL BOX AND A GREEN INDUSTRIAL METAL SAW BASE 22′ X 18′ X 31′, SOLD TOGETHER. 117 14 (14) 8 FT. WOODEN PICKET FENCE PANELS 8 FT. X 41″. 118 1 DOUG’S FOLDING ICE CREAM SIGN. 119 1 ROAD BLASTER BY ATARI VIDEO GAME (NON WORKING). 121 1 (4) PALLETS OF HOUSEHOLD AND REST. EQUIPMENT, TO BE SOLD AS ONE LOT, BUYER TO TAKE ALL ITEMS. 122 1 (5) PALLETS OF HOUSEHOLD AND REST. EQUIPMENT, TO BE SOLD AS ONE LOT, BUYER TO TAKE ALL ITEMS. 123 1 SMALL ICE BOX, MEASURING; 26′ X 14 1/2″ X 42 1/2″, METAL EXTERIOR. 124 1 HOBART COFFEE GRINDER, WORKING CONDITION, MODEL 1030, 110 VOLT. 127 1 GROUPING OF VARIOUS TIN WARE AND WOODEN GINGERBREAD TRIM PIECES. 128 1 GROUPING OF CANNING JARS AND PLASTIC GARBAGE CAN. 129 1 VINTAGE 5 FT. T&C COMPANY POPCORN DISPENSER, MODEL TC-10. 130 1 CHERRY BRAND CREAM CROCK, MISSING LID. 131 1 VINTAGE BRASS COUNTER STOOL. 132 1 5 FT. WOODEN TOBAGGAN. 133 1 GROUPING OF VARIOUS HOUSEHOLD ITEMS, ALLBSOLD TOGETHER, BIDDER TO TAKE ALL ITEMS. 134 1 GROUPING OF NEW CLAPBOARD SIDING, STAINED A MID-COLOR GRAY. 135 1 GROUPING OF LAWN AND GARDEN ITEMS. 136 1 (2) VEHICLE BIKE RACKS. 137 1 MEDINA RIVER CHARCOAL SMOKER / GRILL. 138 1 GROUPING OF ITEMS IN THE CORNER: SCRAP AND VARIOUS HOUSEOLD ITEMS. 139 1 MK 770 WORKING TILE SAW W/ WATER PUMP, USED CONDITION. 140 1 VINTAGE DEWALT RADIAL ARM SAW, AND NON-WORKING CRAFTSMAN TABLE SAW. 141 1 FREE STANDING CADILLAC COOKER/SMOKER, MEASURES: 5’X4′, W/ 2 NEW ELECTRIC MOTORS. USED CONDITION, BUT WELL MAINTAINED. 142 1 EXHAUST FAN W/ PORTABLE WATER PUMP, AND GREASE TRAP. 143 1 5 TON LENNOX BRAND HEAT PUMP: SOLD WITH AIR CONDITIONER. ALL DUCTING TO BE REMOVED BY SUCCESSFUL BIDDER AND ANY HOLES TO THE BUILDING TO BE REPAIRED. 144 1 ITEM HAS BEEN REMOVED FROM AUCTION. 145 1 GROUPING OF ALL STONE WALLS IN THE METAL GRIDS; SUCCESSFUL BIDDER WILL WIN THE METAL GRIDS, FLAT STONES ON THE OUTSIDE, AND ANY ROUND STONES IN THE INSIDE OF THE GRIDWORK. 146 1 (14) WOODEN PICNIC TABLES LOCATED IN THE BEER GARDEN. 149 1 GROUPING OF VINTAGE VACUUM TUBES (CRATE FULL). 150 1 GROUPING W/ ICE TONGS, FLOOR LIGHT, AND AN OLD CLOTHES WRINGER. By bidding with our auction company, you are agreeing to the following. -All sales are final. Everything is sold “AS IS” with no guarantees unless otherwise stated by the auctioneer. It is the responsibility of the bidder to assure him or herself as to the condition of items prior to bidding. Condition reports given by the staff of Bontrager’s Auction Service are subjective, and while we strive to be honest, we will not be held responsible or liable for any errors in description. Buyer is responsible for examining items before bidding. Auction company does not take responsibility for buyer’s failure to examine. Merchandise is not subject to adjustments once the item has been sold. -Bontrager Real Estate & Auction Service and its staff will not be held responsible or liable for any errors in absentee/left bids or phone bids, nor for the possible failure to execute left bids for any reason. -Payment is due in full within the time limits posted in the auction. We accept cash, good check, Visa or MasterCard. (Please note that while you may be able to register for our auction with any credit card, we will only accept Visa or MasterCard for payment.) 13% buyer’s premium and NYS sales tax added to all items purchased. Late payment will result in a $5 late fee. -By bidding with our auction you are entering into a contract with our terms and conditions. You are accepting responsibility to perform your duties as winning bidder, and agreeing that Bontrager Real Estate & Auction Service, its employees, officers, owners, representatives, agents, and consignors will not be held liable for any losses, claims, liabilities, judgments, expenses, fees, or other damages arising from the use of our services, website, auction property, and this site, including property damage, injuries, dispute with another bidder, or breach by bidder of this site. Any liability to a purchaser will not exceed the purchase price actually paid. -Bontrager Real Estate & Auction Service will not be held responsible for any interruption in interent service, errors, and/or omissions, caused by any means and does not guarantee continual, uninterrupted or error free service or use of the Site. By bidding with our company you are accepting that this auction is conducted electronically and relies on hardware and software that may malfunction without warning. -Bontrager Real Estate & Auctio Service has the right to void any sale, suspend bidding, re-sell any item/lots for any other reason. -All sales are subject to appropriate sales tax and buyer’s premium. Buyer’s premium is 13% of purchase price and is subject to sales tax. A 3% discount is taken from the buyer’s premium if payment is made with good check or cash. -Bids cannot be retracted once the auction begins. -Buyers are responsible for making arrangement to pay for and pick up items within the time frames listed for the auction. Bontrager’s Auction Service is not liable for any damage to property left on the auction premises after the auction, whether or not payment has been made. We reserve the right to impose a storage fee of $10 per month for property not picked up within stated deadlines. Merchandise left 1 month after the auction is subject to sale with the proceeds covering storage and auction fees due to the auction company. -In the event of legal proceedings arising from this contract or from the auction in connection therewith, buyer consents to being subject to the personal jurisdiction of the courts of the State of New York, Genesee County. 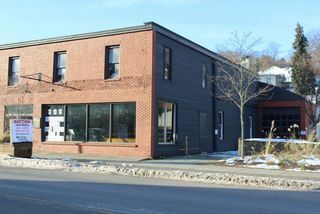 111 North Franklin Street, Watkins Glen, NY, 14891: From NYS Thruway, take Exit 42. Follow Route 14 South to Watkins Glen. Route 14 becomes Franklin Street within the downtown area. 111 North Franklin Street is on the west side of the street, between 1st and 2nd Streets.